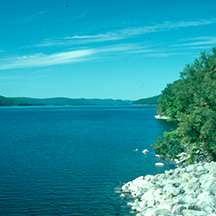 Few large lakes in Massachusetts are naturally occurring. Those that are naturally occurring are referred to as “Great Ponds.” Most large lakes in Massachusetts are reservoirs created by dams. Either way, these large lakes provide important habitat for loons and migratory waterfowl, as well as a large number of fish and wildlife species that depend on aquatic environments.